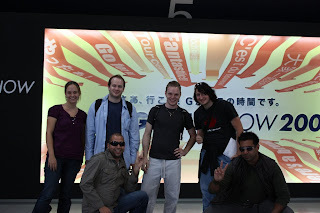 This Sunday I went to the Tokyo Game Show 2008 with some of the Ashikaga crew. It bore a striking resemblence to last year's show. I think that it might have actually been more crowded than it was last year though. It is located in the Makuhari Messe convention center in Chiba. The big ticket game being previewed this year was Resident Evil 5. The little movie about it on display made it look pretty darn cool. I wouldn't have minded checking it out, but the line to play it was 3 HOURS LONG! Ahhhh! Ok, I need to address this. I think that Japan is way too accepting of this waiting in line business. Come on people, can't you give me a ticket with a time to come back on it? Do I really need to be physically in the same spot long enough to give myself a blood clot? This is ridiculous. You might not hear about the dark side of the game show from the usual news outlets, because reporters and other people whose time has value get to go on the business days, which I assume aren't so awful. Bah! Although I didn't get to see the beloved Resident Evil, I got a chance to play the Dead Rising port for the Wii called Dead Rising: Chop Till You Drop. While it is always fun to bash zombies' heads in, I must say that this game is a miss. One of the things that made this game great on Xbox 360 was the huge amount of zombies that can be on the screen at one time. When your character opens a door and finds three hundred undead on the other side, it can be a bit unnerving, but in a good way. I think that the Wii's hardware limitations will really take some of the flair away from this game, as I hear that only 100 enemies can be onscreen. That combined with a general arcade style overhall makes the game feel like it is geared towards very casual players with short attention spans. Catch the 360 version if you wanna be cool. While waiting in line we were given these cards that explain the controls. They even had an English one! Its a nice idea considering the copious amount of free time that a line provides. Studying this also lets one avoid looking like a dope when everyone is watching you play. Just as last year, a highlight of the show is all of the people dressed up as video game characters. Most of these people are very serious, and often their costumes are flawless. I wondered how they constructed some of their props. Unfortunately I only recognized a few of the characters. Here are some random people preparing. They seemed to have a pretty tight community going on, and often they were taking pictures of eachother. Here are a couple of girls from Street Fighter taking shots of Tidus from Final Fantasy X. This was my favorite group of the day. These are just about movie-quality representations of Rikku, Tidus, and Yuna from Final Fantasy X, and yes I realize that I am a big nerd. Here is a short little clip of the costume area. It is located between two giant buildings. Next are a few shots to give a bit of perspective on the show. Our crew has a few new faces. Kim, Clarence, Me, Shaun, Joe, and Zishan. It was fun, but I think that this will be my last Game Show, one way or another. Later in the day I found something beautiful. 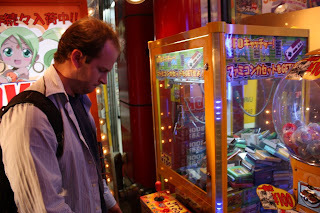 Its a claw game with Nintendo cartridges inside! I know! Wow!